Where most pitcher plants have a sort of “lid” this one has more of a hood. 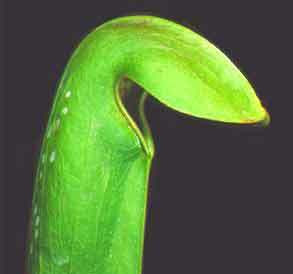 It has small pitchers which is where the name “minor” comes from. The species only gets about 12 inches tall. Notice the white dots on the back of the pitcher? Some other Sarracenias have similar patterns and they are thought to attract insects as it allows light into the otherwise dark pitcher. It may also cause confusion for insects trying to escape. I’m not sure why, but this is one of my favorite pitcher plants. Perhaps the dainty size or the cool looking hoods, but either way I just love it.